Dale Edward Larson was born December 3, 1922, to Herman and Edna Larson at Carpio, North Dakota, the third of six children. He grew up on the family farm near Aurelia, ND. Dale graduated in 1940 from Donnybrook High School and attended one year at Minot State Teachers College. He helped on the family farm before being trained as a railroad depot agent with the Great Northern Railroad. He worked a variety of railroad positions and locations in Oregon and North Dakota. One job in 1943 brought him to Tioga, ND as a relief depot agent. There, he met Betty Christensen, his future wife. Dale was drafted into the US Army later that year and served until 1945. He was stationed in Louisiana for basic training and in England for more specific training before being stationed in France, Belgium, and Germany as a depot agent on the railroad supply lines. He rose to the rank of Tech Sergeant in the US Army. His Army services and travels gave him a new window on the world. During his entire military service, he and Betty wrote letters regularly to each other. They were married on September 1, 1946, following his honorable discharge from the Army and his return to ND. In January of 1947, they put their few belongings in a box car and headed to Dale’s new depot agent position with the Great Northern at Pillsbury, ND. Though he thought it would be a short-term location, they stayed in Pillsbury until 1974, raising their two daughters, Marilyn and Vicki and making many lifelong friends. Dale served on the Pillsbury Public School Board of Directors for 11 years and it was while he lived in Pillsbury that he experimented with a variety of sporting activities, baseball, fishing, bowling, and most significantly, golf. In the mid 1950’s he took a home study course to learn how to fix radios and TVs and as a result, he ran a very busy repair and sales business until 1969. He was a depot agent by day and a TV repairman on evenings and weekends. From 1958 to 1965, he planned two- and three-week yearly camping trips with his family, traveling through 40 states with occasional explorations in Mexico and Canada. Many great memories were created by his planning and adventurous spirit. In 1974, Dale accepted the Depot Agent position in Fergus Falls, MN, working there until his retirement from the Burlington Northern railroad in 1982. During this period, his six grandchildren were born. He took great joy in entertaining them with his quick hands making things disappear and asking, “Where did it go?” His granddaughter, Krista, called him her “foxy grandpa” as he was a trickster. His five grandsons also called him the “gluing grandpa” as he could fix any of their prized positions and toys at his well-appointed workbench. The next many years found Dale and Betty wintering in Mesa, Arizona. They enjoyed meeting new friends, golfing, and the pleasant weather. In retirement, they toured Europe and cruised Mexican ports among other trips. In later years, Dale and Betty enjoyed life at Mill Street Residence and finally experiencing the excellent care at PioneerCare, both in Fergus Falls. Dale was a lifetime member of the American Legion and Veterans of Foreign Wars. 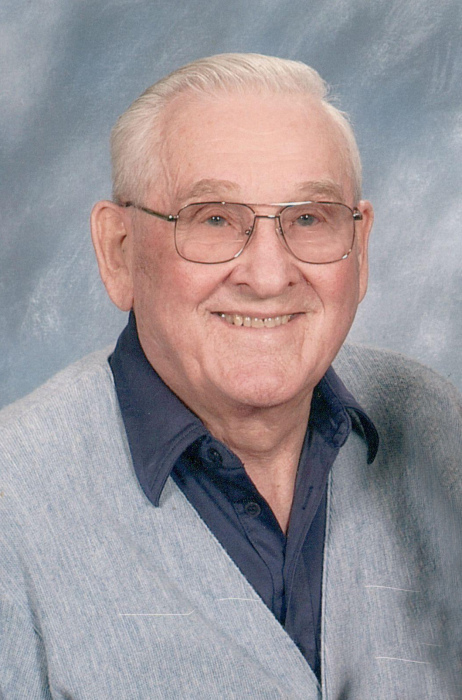 On April 14, 2019 after a short illness, he passed away at Lake Region Healthcare in Fergus Falls with his daughters close by. Dale is survived by his two daughters, Marilyn Leraas (Roger Knapp) of Alexandria MN and Vicki Neuharth (Gary) of Bismarck, ND; five grandsons, Murray Leraas (Courtney) of Eagan, MN, John Leraas (Melissa) of Delano, MN, Garik Leraas (Leslie) of Alexandria, Thomas Neuharth of Bismarck, and Grant Neuharth (Emily) of Lakewood, CO; nine great grandchildren, Briauna, Rilynn, Avery, Emersyn, Landan, Khalan, Kherington, Kennedy (Lynn), and Karsyn Leraas; sisters, Alverda Larsen of Minot, ND, Darlene Stephan (Earl) of Rochester, MN, and Ardella Johnson of Minot; sister-in- law, Marjorie Larson of Kenmare, ND; and many nieces and nephews. Dale was preceded in death by his wife of 71 years, Betty (Christensen) Larson; his parents; his granddaughter, Krista Leraas; son-in-law, Charles Leraas; his brothers, Verlund Larson, Dallas Larson and his wife Esther; his brothers-in-law, Warren Larsen and Paul Johnson; his sisters-in-law, Dorothy Eraas and her husband Orville and Lois Ridgeway and her husband Elmer.